Endorsed by the United Nations, UNESCO, and the International Astronomical Union, 2009 is designated as the International Year of Astronomy (IYA) and provides a year to celebrate and reflect on 400 years of changing perspectives of the universe. 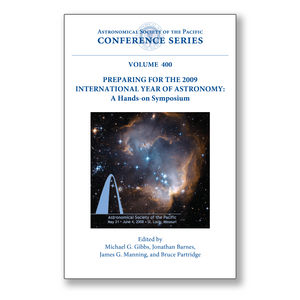 In conjunction with the American Astronomical Society (AAS), the Astronomical Society of the Pacific (ASP) convened an IYA symposium and series of workshops at the AAS summer meeting in St. Louis, Missouri, USA, from May 31 to June 4, 2008. During this conference, astronomy and space science professionals gathered to share ideas and plans, forge connections and collaborations, and organize their efforts to make 2009 a singular year for advancing astronomy awareness and education. This volume contains the content of the meeting, plus an additional resource section. It serves as a reference to aid those involved in the IYA as they make professional connections, access resources, and maximize their efforts to encourage the world's citizens to look up and discover anew the universe around us. The Astronomical Society of the Pacific (ASP), founded in 1889, increases the understanding and appreciation of astronomy by engaging scientists, educators, enthusiasts and the public to advance science and science literacy. Visit www.astrosociety.org for additional information regarding the ASP and how you can join the Society and support the cause of improving science literacy.